Contrary to the title of this post, I am NOT Ready for Christmas! Ready for Christmas, in this case, refers to the adorable stamp set available in the Holiday Catalogue. It also has coordinating thinlits, the Christmas Staircase Thinlits Dies, which I highly recommend you get! You can purchase the Bundle (both stamps and thinlits) and Save 10%! Have I mentioned that I LOVE this Bundle?! Seriously – not only is it adorable for creating Christmas scenes on your cards, scrapbook pages, tags and 3D gifts, but you can use it all year! I created this card for my Holiday Catalogue Celebration, so I used it in a Christmas theme. See – I told you it was adorable!! That little Dachshund just makes me smile, every time! I went with the traditional Christmas colours; red and green. This card was super quick to make, because every stamped image has it’s own thinlit, and I used another framelit and a punch for the rest! I started with a card base of Whisper White cardstock; the basic 8 1/2″ x 5 1/2″, scored and folded at 4 1/4″. On top of that is a panel of Be Merry Designer Series Paper, measuring 4″ x 5 1/4″. For the dog and the cookies, I stamped the images onto Whisper White with Memento black ink. Colouring is done with a Blender Pen, and picking up ink from the lids of the Cherry Cobbler, Pear Pizzazz ink for the dog’s sweater; Crumb Cake for the dog and cookies, and Pool Party ink for the plate. The table is stamped in Memento black ink onto a piece of Wood Textures DSP. Then, all the images are die cut using the Big Shot and Christmas Staircase Thinlits Dies. The sentiment is stamped in Cherry Cobbler ink onto a strip of Whisper White; the banner ends created with the Banner Triple Punch. The large oval is created using the Stitched Shapes Framelits. Putting the card front together was a snap! The oval is attached to the front with Stampin’ Dimensionals, and then the rest of the pieces layered onto that, also with Dimensionals. The sentiment banner is then added across the top of the front panel. 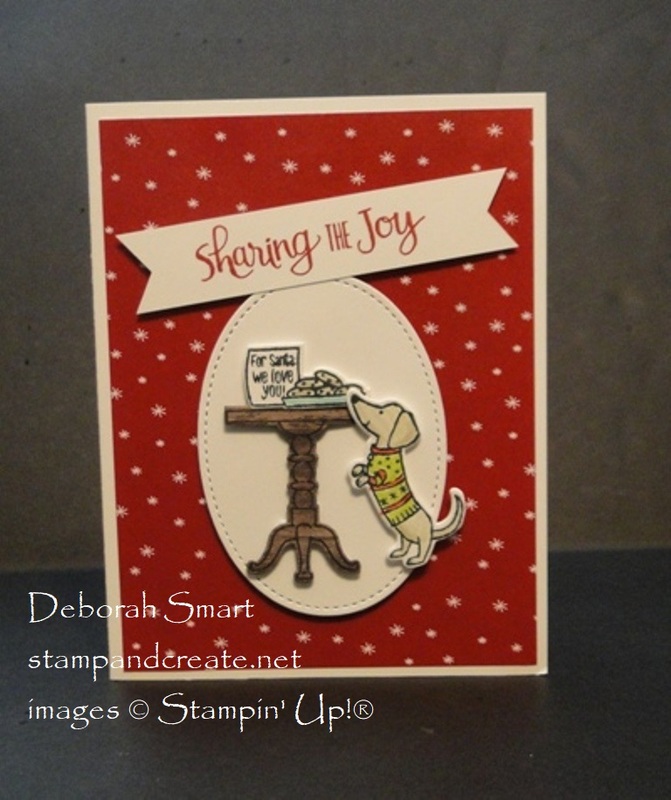 You can order your products to recreate this card by clicking on the images below. My online store is open 24 hours a day, so you can shop at your own convenience. Remember – during September and October, if you order $375 or more, you automatically qualify to receive the FREE Merry Patterns stamp set! And ordering in October means you can take advantage of the Cardmaking Essentials sale and the Buy 3, Get 1 Free Designer Series Paper sale! You can read all about these specials in THIS POST. Previous Previous post: October Specials For You! So cute! Love that little dog checking out the cookies. He’s just adorable, isn’t he?! 🙂 Makes me smile every time (and I’d probably give him a cookie, too!) Thanks for your comment, Buffy!